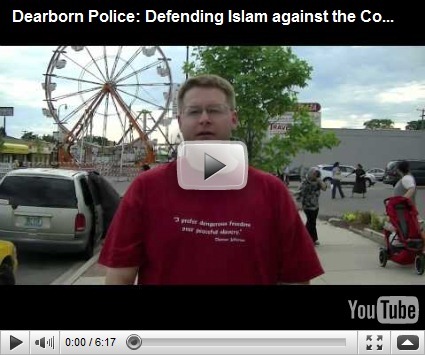 Sharia Law in America – Is it Possible? : YES! Our Founding Fathers put forth after much debating, many fortunes being lost and much bloodshed two documents for us to live by: the Declaration of Independence and the Constitution. As we are approaching the 234th year of our founding a weed had sprouted up in our Garden of Liberty – Sharia Law. Sharia Law does not follow the Rule of Law as we know it in America. They have their own brand of justice and their own court system. One of the scariest things I have seen is not the American influence on Sharia Law but the influence of Sharia Law on American citizens that is enforced on them by local police departments. Below is a video that documents such an event. Take note the number of demonstrators, where they are located and the number of police that arrived on the scene. Section 1. A. The judicial power of this State shall be vested in the Senate, sitting as a Court of Impeachment, a Supreme Court, the Court of Criminal Appeals, the Court on the Judiciary, the State Industrial Workers’ Compensation Court, the Court of Bank Review, the Court of Tax Review, and such intermediate appellate courts as may be provided by statute, District Courts, and such Boards, Agencies and Commissions created by the Constitution or established by statute as exercise adjudicative authority or render decisions in individual proceedings. Provided that the Court of Criminal Appeals, the State Industrial Workers’ Compensation Court, the Court of Bank Review and the Court of Tax Review and such Boards, Agencies and Commissions as have been established by statute shall continue in effect, subject to the power of the Legislature to change or abolish said Courts, Boards, Agencies, or Commissions. Municipal Courts in cities or incorporated towns shall continue in effect and shall be subject to creation, abolition or alteration by the Legislature by general laws, but shall be limited in jurisdiction to criminal and traffic proceedings arising out of infractions of the provisions of ordinances of cities and towns or of duly adopted regulations authorized by such ordinances. B. Subsection C of this section shall be known as the "Save Our State Amendment". C. The Courts provided for in subsection A of this section, when exercising their judicial authority, shall uphold and adhere to the law as provided in the United States Constitution, the Oklahoma Constitution, the United States Code, federal regulations promulgated pursuant thereto, established common law, the Oklahoma Statutes and rules promulgated pursuant thereto, and if necessary the law of another state of the United States provided the law of the other state does not include Sharia Law, in making judicial decisions. The courts shall not look to the legal precepts of other nations or cultures. Specifically, the courts shall not consider international law or Sharia Law. The provisions of this subsection shall apply to all cases before the respective courts including, but not limited to, cases of first impression. We as Americans need to wake up to the reality that there are people who don’t think and act the way we do and want to silence us in every way, up to incarceration and death. Do not romanticize the Bible saying to yourself, “If Jesus did it and Paul did it then it’s good enough for me. Please understand that they suffered what they suffered so you don’t have to. They lived under dictatorships so you don’t have to. I have said it before and in here it bears repeating. When you as a member of the Church in America stand before God and He asks the question, “What did you do with the freedom that I gave you”? What will be your response? Choose wisely America while you still have the freedom to do so. ← The State of Louisiana gets it, Why Doesn’t the Church in America? I'm am constantly amazed at how the MSCs (main stream churches) fail to acknowledge the fact that Christianity is becoming a crime in many parts of the world and the UN is working to ban preaching the Gospel world wide. Christians need to wake up and realize what is really going on! "the courts shall not consider international law"That part is where this measure has problems. I would support this measure IF that part was not included.International law is currently referenced in contract disputes where the negotiations resulted in the choice of venue being one country while the choice of law is another. See Panama Processes v. Cities Services (1990 OK 66, 796 P.2d 276).Another issue with barring the courts from considering international law is recognition of marriages which occur in a foreign country where their legal requirements do not parallel ours. How is the court to determine that such a marriage was legally constructed?